Following the success of the sponsored bicycle ride by the Princess of Wales Royal Regiment that raised over £6,000 for the Thiepval Project in 2002, a second sponsored ride was organised by four Oundelians. They rode from Verdun to Ypres via Thiepval. They also raised £6,000 ! Two hundred and twenty six Old Oundelians died in the Great War and on their way the girls visited the graves and memorials of sixty of them. Ten are on the Thiepval Memorial and eleven more have graves in the Somme cemeteries. The distance from Verdun to Ypres is 250 miles and they arrived at Thiepval on the morning of Friday 18th July 2003 with the local French press and television in attendance. "Some Desperate Glory" Her Majesty's Theatre, Haymarket, London. Some Desperate Glory was a unique evening performance of words, music and film about the Great War. Proceeds from ticket sales went towards the Thiepval Visitor Centre. There was also the premier screening of War Game based on the book by Michael Foreman. The works chosen for performance included poetry and prose by Vera Britten Rudyard Kipling, AA Milne, Wilfred Owen, Siegfried Sassoon, John Masefield and Edward Thomas. 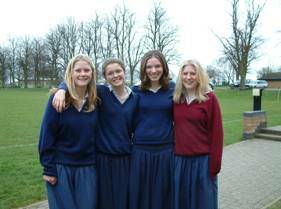 The event was the original idea of Michael Morpurgo, the award-winning children's writer. The performance was directed by Tim Supple, in association with The Really Useful Group, the Wilfred Owen Association and the Western Front Association. The performance was generously sponsored by Harper Collins Ltd. The following is an appreciation written by Helen McPhail. What a remarkable evening it was! Several hundred people in a West End theatre, on the eve of Armistice Day, not sure what to expect, together with some keyed-up promoters and a dedicated and hard-working group of actors, singers and theatre staff. One man’s imaginative response to a ‘begging letter’ was to tap into his friendships and contacts to set up a unique theatrical evening: the result was unforgettable, impressive, immensely rewarding for the audience — and for the Project’s funds. This was Michael Morpurgo, the well-known children’s author who has written very effectively for his young readership about the First World War. The evening opened with an air played on the Northumberland pipes, introducing a sequence of poems or prose extracts read by some of our leading actors; between their contributions at the microphone, each had his or her own chair set around the stage, sitting with quiet concentration against a plain black backing. This simplicity of staging enabled us, the audience, to concentrate equally in response, for we were seeing first-rank actors, generous with their time and expertise, who made full use of theis plain setting to give the material its full value: Jim Broadbent, Michelle Butterly, Chewitel Ejiofor, Susannah Harker, Tony Haygarth, Saeed Jaffrey, Jane Lapotaire, Michael Pennington and Samuel West; the songs were performed by Coope, Boyes and Simpson, offering their own songs that interpreted life on the Western Front. The readings presented authors ranging from the familiar (Sassoon, Owen, Gurney, Edward Thomas, Kipling, Graves, Vera Brittain) to the some perhaps less well-known, or unfamiliar in this context (Yeats, Rose Macaulay, Charles Harrison, Herbert Read, Teresa Hooley, Eleanor Farjeon, Ted Hughes, Claire Elise Tisdall, Margaret Cole, John Masefield). So far, so — perhaps — predictable: but the second part of the evening opened with the first public showing of a fine new animated film, a prize-winning production of ‘War Boy’ based on the children’s book of the same name by Michael Foreman. A straightforward story told with clarity and humanity, it showed how a cheerful farm boy, and keen footballer, joined up in 1914 with his friends, what happened to him (including the famous ‘Christmas Truce’) and how his family felt. The combination of actors reading, the songs and the film brought this rich material together for form a seamless whole, a memorable occasion which left us all enriched in its thoughtfulness and presentation. Expenses were kept to an absolute minimum (supported by the great generosity of publishers HarperCollins and theatre managers The Really Useful Company as well as by the performers’ willingness to give their own time); and everyone concerned appreciated the professional skills of director Tim Supple, who created a remarkable event with the minimum of rehearsal time and the total collaboration of the professional participants. The intense and concentrated silence throughout the evening was a tribute in itself to the power of the material, and the skills of those on stage. When Michael Morpurgo, the original instigator of the occasion, came on stage at the end of the evening and announced that ‘around £5,000 - £6,000 would go the Thiepval Project’ the applause was as great as for the performers themselves. The hard work and whole-hearted involvement of everyone who took part or who sponsored the event encouraged and rewarded the organisers for their months of preparation, and enabled the fortunate audience to take away vivid memories and lasting appreciation. Helen Mcphail. 1st December 2002. 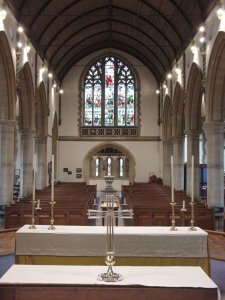 On Sunday 10th November 2002, the Thiepval project was pleased to be represented by Carol Nubbert at the occasion of the Remembrance Service for the re-dedication of the Great West Window at St. Peter’s Church in Bushey Heath, which has recently been restored. In the months leading up to the Remembrance Service, churchwarden of St. Peter’s, Bryon Parkin, set out to investigate the origins of the Great West Window, after he had noted the inscription at the window’s base, which indicated that it had been created in honour of Lt. Basil Perrin Hicks of the 8th Battalion Berkshire Regiment. He discovered that Basil Perrin Hicks was the second son of William Mitchison Hicks, the founding Vice-Chancellor of Sheffield University and his wife Ellen Perrin. Educated at Rugby, and Trinity College, Cambridge from where he graduated in modern languages in 1914, Basil joined the Inns of Court Training Corps and was gazetted 2nd Lt. 8th Berkshire Regiment in September 1914. Promoted Lieutenant in March 1915, he was killed in action at Hulluch, shot through the heart whilst leading the scout section of his battalion in the first attack at the Battle of Loos on 25th September 1915. Lt. Hicks’ Commanding Officer wrote of him “By his death the regiment has lost not only a charming companion, but a very clever and most promising officer in his special line – map-making and the training of scouts – I shall never be able to replace him. I was a great admirer of his work and if only he had been spared, I am sure he would have made a name for himself. Nothing was too much trouble for him, and the scouts, of whom he was in charge, just worshipped him.” And a private who was with him when he was killed pays this tribute “He was a game one. He fell right on the German parapet, his last words being ‘Good lads, come on – straight ahead!” He was buried where he fell, but he was later re-interred at Dud Corner Cemetery, Loos. Henry Perrin, Lt. Hicks’ uncle, had the window created by Henry Holiday in memory of his nephew. Henry Holiday was an artist of some distinction, who exhibited regularly at the Royal Academy from about 1858 and is probably best known for his painting ‘Dante and Beatrice’ which is now in the Walker Art Gallery in Liverpool. In about 1861, he turned his attentions to stained glass work and became principal stained glass designer for the old-established Whitefriars Glass Firm of Powell & Sons. 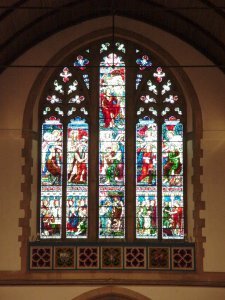 In 1891, he established his own glass-making firm in Hampstead and his more notable commissions include the Brunel Memorial Window in Westminster Abbey, and windows in Trinity College, Cambridge and in the Grace Cathedral in New York amongst others. In Bushey, Holiday was responsible for two items in St. Peter’s Church, the Great West or Holy Trinity West Window and lights in the North Aisle. He was also responsible for the chancel East window in St. Margaret’s School Chapel (Christ Blessing Children). Due to his painstaking research, Mr. Parkin was able to find relatives of Lt. Hicks, who attended the remembrance service. Also present, were a representative of Sheffield University where Lt. Hicks’ father was the founding Vice-Chancellor and who contributed towards the restoration, and Arthur Tatham whose great-grandfather was Commanding Officer of the 8th Berkshire Regiment. Arthur has spent several years researching the soldiers of his grandfather’s company from a photograph found amongst his great-grandfather’s possessions. The family remembrance service at St. Peter’s movingly commemorated all those who fell during the two world wars, and the church service collection of a most generous £500 was donated to the Thiepval Project’s funds in memory of Lt. Basil Perrin Hicks, for which we are very grateful. Revd. 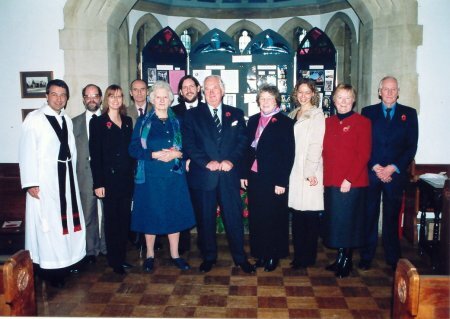 Robbie Low (Vicar of St. Peter’s Church), John Hawthorne (Sheffield University), Carol Nubbert (Thiepval Project), Peter Craven (CWGC), Miss Veronica Perrin, Arthur Tatham (Researcher), Henry F. Perrin, Mrs. Hannah Perrin, Rachel Smith (Window Restorer), Enid Jarvis (St. Margaret’s School) and Bryon Parkin (Church warden). The next pictures show the Great West Window in its renewed splendour.